Newcomers from all over the world emigrate to the Isthmus of Panama bringing along their culture and language. Today, at least 15 different languages make up the linguistic landscape of Panama. The predominant language is Spanish and the language of international business is English. Two Chinese languages are growing in importance while Hebrew, Hindi, and Arabic have also taken root as important enclaves of merchant activity across the urban spaces of Panama. As world trade becomes increasingly multilateral, new linguistic spaces become operational in cities sometimes replacing existing dominant languages, but in other instances diversifying opportunities as alternatives to the established oligopolies. Countries with high rates of economic growth like Panama see more dynamism on this aspect. Non-Latin scripts also diversify the legible landscape of Panama. Not only are these scripts increasingly practical to learn for their utility in the expanding market, but also for their potential to make a multicultural landscape more heterogeneous. By no means does this mean that diversity is voided of animosity across cultural groups. Indeed, towards the periphery of Panama’s linguistic landscape, among the least powerful folk, in terms of their economic power, indigenous communities become vulnerable to conspicuous actors and state institutions. At the border with capitalism, this otherwise illegible landscape includes seven indigenous languages that together make up ~12% of the population of Panama. On the physical and cultural borders with these communities, national education regimes are characteristically colonial, marking the injustice of cultural hegemony that continues to obscure self-determination of indigenous people. In turn, some groups resist by innovating alternative pedagogies and engaging literacy critically. 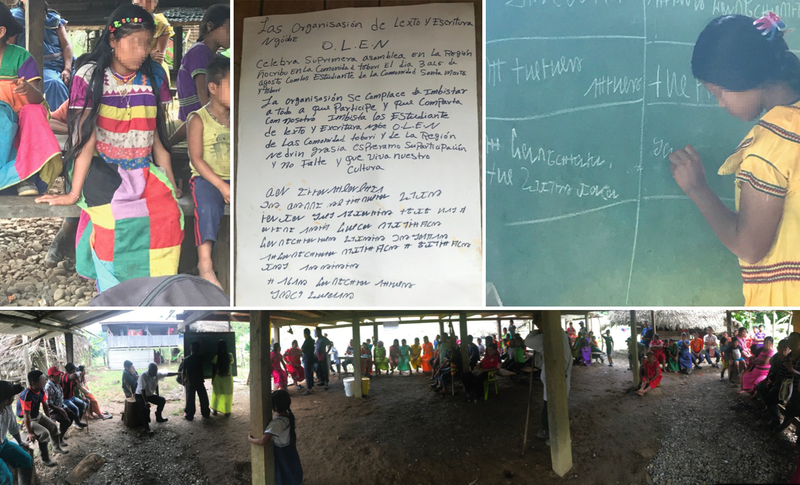 Among the largest indigenous group in Panama, the Ngäbe, a new orthography and pedagogy has surfaced against the odds. It has the potential of being a model for decolonization, revitalization, and empowerment across the region. The changing linguistic landscape of Panama not only takes shape from international commercial flows but also from indigenous intellect and purpose. This chapter first presents an overview of the current linguistic landscape of Panama (Fig. 1). With special attention to minorities, this study zooms in to look at the distribution of these living languages and then moves deeper into the case of Ngäbere, the most prevalent of the Chibchan languages (Fig. 2). Ngäbere was formerly known as Guaymí. According to Ethnologue, it is currently a language in development (Ethnologue 2018). Moreover, Ngäbere has three regional variations which influences how the language is studied and how its politics unravels. At a smaller scale, internal discord paints over this indigenous linguistic landscape. A new and autochthonous orthography has made an appearance, challenging not only the modus operandi of national schooling and Christian aid, but also the establishment in their Ngäbe General Congress, religion, and folklore. This orthography has been developed into an alternative writing system, including a pedagogical program. It differs from the established Latin script, which is currently a widespread convention, as it has been pushed by Christian missionaries and more recently by the state (EIB 2005). This chapter will thus navigate from the broad (state) to the specific (indigeneity) and back. Carrying a novel decolonization paradigm, this particular indigenous border/hinterland has implications for larger society. Today, the linguistic landscape of Panama is different from pre-Columbian times, but continues to show strong indigenous presence. A particular landscape denotes a space where human-environment interactions take place (Olwig 1996); in this chapter, language serves as the thread that joins the environment with the human. 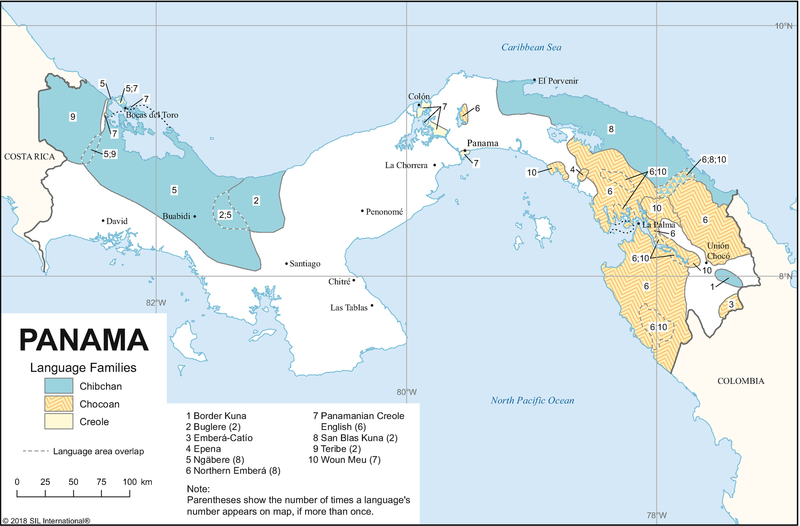 Figure 1 is a map that broadly delineates these endemic languages of Panama. Three categories encapsulate today’s language minorities. The Chocoan language communities are located in the southeast of Panama, mostly due to migrations from Colombia’s Pacific coast. The Chibchan languages have existed for the longest consecutive time in the isthmus: present day Costa Rica, Panama, and northwest Colombia. The Creole languages first appeared with the arrival of African descendants from the Caribbean and the Antilles, who under English and American influence combined their tongue with their oppressor’s. In general terms the current linguistic landscape of Panama looks as shown in Fig. 1, but underneath these representative borders there are important nuances to uncover. Ngäbere is an exemplary case because it is currently developing in unique ways at the periphery of the institutional language, Spanish. In support of this claim, the author employs his latest travel documentation on the spread of contemporary Ngäbere script. The living languages of Panama are classified by Ethnologue as institutional (National; i.e. Spanish), developing (i.e. Ngäbere, Guna, Teribe, Wounaan), vigorous (i.e., Hakka Chinese, English Creole), threatened (i.e., Catío), dispersed (i.e., Yiddish, Epena), and nearly extinct (i.e., French Creole). 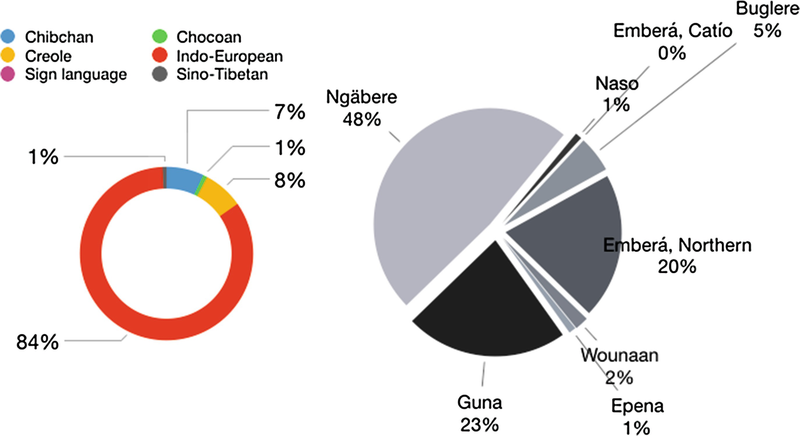 Figure 2 shows the magnitude that Spanish and other European languages have in comparison to the endemic and afro-descendant populations and the relative distribution of indigenous languages today, Ngäbere being the largest. To link present indigenous living languages to their past, this chapter will interlace the ethnohistory of the Cueva language with the ethnography of Ngäbere. These disparate language families once shared the same isthmian landscape and faced the violence of colonization. One perished and the other keeps on living by revitalizing its culture and language. Archaeology and ethnohistory are two established methodologies that aid scientific understanding of the “prehistoric” cultural landscapes often oversimplified by nationalist or imperial histories. Sometimes “prehistory” can be understood as stolen or neglected histories, even when they have been written down. Archaeological questions into the development of Panamanian settlements have also focused on ethnohistoric documentation (Cooke 1993; Roosevelt 1979; Helms 1979, 1992, 1994; Sauer 1966). 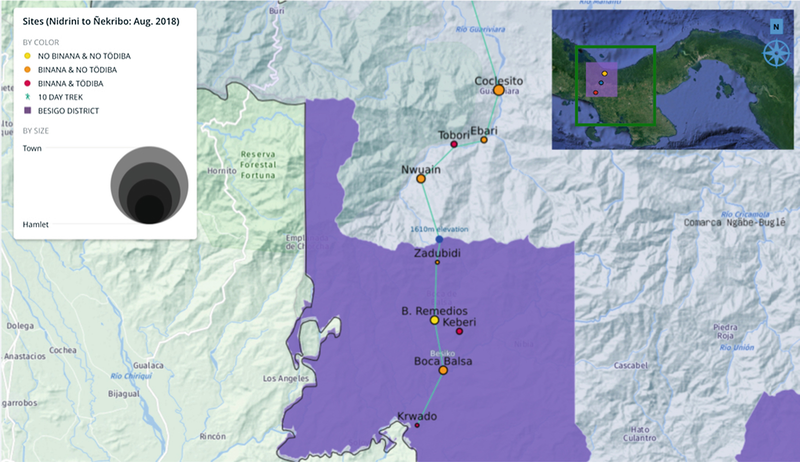 The ethnohistoric record for Panama describes pre-Columbian societies as being quite diverse, ranging from small settlements with little disparity in wealth to loosely integrated macroregional polities (Castillero Calvo 2004; Oviedo 1986). Ethnohistory utilizes texts and multiple archival materials like maps or illustrations that can potentially shed light over the social aspects of people – usually non-Western peoples – as they administered themselves and their resources in the past. Indeed, “only with the emergence of ethnohistory does analysis of natives as agents in the colonization process even begin to become possible” (Sluyter 2001: 417). The ethnohistorical accounts of Panama shed light on an important parallel. Precolonial Panama had the Cueva language, which were previously imagined to be confined to as a single cultural group of eastern Panama. Carl O. Sauer (1966: 284) writes that Bishop Quevedo in 1515 had informed King Ferdinand that in Panama, 17 Cueva caciques were at peace with the Spaniards. Quevedo writes that each Cueva chief had a province to himself and persons whom they ruled over. However, Sauer remarks that not many Spanish explorers ventured across the isthmus, that it was rather a place where people [from Europe] came to get rich quickly and leave. Little is known about the past peoples of this region, but it is now theorized that Cueva was a lingua franca among Chocoan languages rather than just a linguistic community of people (Cooke n.d.; Cooke and Sánchez Herrera 2004; Howe 1977; Romoli 1987; Sauer 1966; Velasquez-Runk 2015). Thus, the Cueva language was used between different trading groups living in the isthmus until 1535, when it succumbed to Spanish (Romoli 1987). 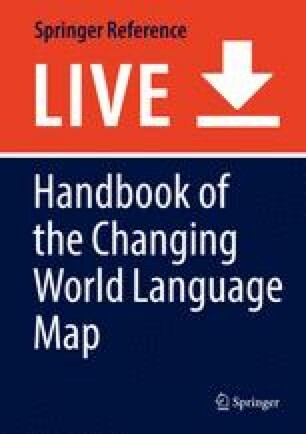 An extra-geographical reference from the Olde World, lingua franca is a ubiquitous term that comes from the Romans (~third century AD), who used it to mean the language of the francs (Germanic peoples west of the Rhine), but the term became to be used for Sabir and other Mediterranean pidgins. Spanish is the new lingua franca in Panama, but being so foreign to the indigenous languages it fails to fit in. By replacing the Cueva, the Spanish created a void that filled with violence. The linguistic data left by the Spanish included a small vocabulary of approximately 50 words of the Cueva language (Oviedo 1986). These are recorded in contact-period documents, which also say Cueva was spoken from central Panama to the Gulf of Urabá. At the Colombian Institute of Anthropology, Romoli (1987) writes a more complete survey of the Cueva, “Los de la Lengua de Cueva.” It comprises some words that are cognate with modern Guna and others with modern Wounaan (Constenla Umaña and Margery Peña 1991). One example of a word in Cueva is irabra, meaning gold (Fernández de Oviedo 1959 Tomo III: 325). Gold was of most interest to the Spanish, but it also was an important trading good among the people of Darien and Chocó (via the Gulf of Urabá). If the Cueva served to join indigenous people before 1535, in a similar fashion a Ngäbere orthography could open an alternate route to communicate via writing in the twenty-first century, a crucial time, when indigenous people are seeking revitalization. Core-periphery models aid analyses in economic geography and general understating of hegemony (Wallerstein 1979). Languages, too, have a direct effect on world and regional systems of political influence, autonomy, and power flows. In Panama, the concept allows for a more geographic conceptualization of language status and tendency of decay and growth. Strong core would characterize the institutional or national language, while emerging core would correspond to vigorous or developing, and weakening core to a “threatened” language. Moreover, the permanent periphery constitutes the borders with less organized language communities and declining periphery could be seen from both sides as borders in constant change. The shifts on this core-periphery continuum over time depend on how prominent and effective, how much “soft power,” or the ability of one language community is able to affect the other. Ngäbere is a tone language, with two tones: high and low. It has a set of both oral and nasal vowels; there are 15 (oral and nasal) vowels and 16 consonants. Some sounds of the language are shared with Spanish, while others are quite different. Spanish words are borrowed into Ngäbere with corresponding phonological changes, and sometimes changes of meaning. Learning a native language is arguably the most important duty of a philosopher of place. A language that has evolved in a particular region teaches us best about that place, its contours, nuances, and human approaches to manage the land. The classificatory power of language already makes a grammar out of nature, a cosmography contained in the idiomatic and idiosyncratic stuff of landscape. The Mamatada belief system is at the same time syncretic with traditional Ngäbe beliefs combined with Catholic and Evangelical Christianity. Some accounts say that the Virgin Mary plays a central role (Young 1971); not the case in the author’s experience. Specific interdictions include abdication of drinking alcohol and participating in balsería, a potentially violent game. Additionally, Mamatada advocates separation from the Panamanian government, including restrictions on visiting and engaging in commerce with Latinos (Young 1971). Syncretism, a hybrid category, works to generate confidence, as practitioners build a bridge from the established religious orthodoxy into a new more open to the public philosophy. Their bridge is literally an orthographic and pedagogical program. Tido’s sons and daughters are already trying a new approach whereby they separate the literacy program from Mamatada, to help disseminate it as a secular tool before attaching any kind of politics of religion. This is a quest for authenticity, while simultaneously allowing growth from a practical departure point. What I wish to accomplish is to convey the ongoing multiplicity of events, anecdotes, ideas, and situations that happen not only inside the fixed boundaries of what we might delimit (temporally or spatially) as the language, but also the network of influences from the outside that ultimately construct and legitimize it. My latest travels to the Comarca were to Tobori and Ebari during the months of August and September 2018 (Figs. 3 and 4). It consisted of a 10-day expedition from the southern region of Nidrini to the northern region of Ñekribo. I joined a group of Ngäbe from Kiad in the southeastern region of Kodriri. As we traveled we would join other folk from the different Mamatada hamlets. The goal of the expedition was to gather with others interested in the Ngäbere script. The destination was in Tobori, a small town on the shore of the Guariviara River, which flows into the Lagoon of Chiriquí. There we would gain credence to the establishment of a new Ngäbe school or tödiba. The towns and hamlets on the way would have either a Mamatada church or binana with a tödiba, neither, or only a binana (Fig. 3). The Ngäbe writing system creates a new dimension in contrast to what the Cueva lingua franca would have been to the oral tradition of pre-Columbian times. once was. It is a way of writing that the Chibchan languages could use today amongst themselves as an alternative “written lingua franca” to the Latin script. John Corbett (2011: 307) writes that culture is “the expression of a common purpose and the expectations of certain standards.” This definition encapsulates the central goal of the script Mamatada. The socio-religion movement endeavors to create a common purpose by establishing standards with tools, such as the Ngäbere orthography. But why are indigenous people like the Ngäbe and others like the Nunavut or the Cherokee, who did not have a written language, coming to the realization that they need one? The need for critical literacy, as acknowledged in Freire’s Pedagogy of the Oppressed (1970), is a way to understand. To this, Anderson and Irvine (1993: 82) say, “learning to read and write as part of the process of becoming conscious of one’s experience as historically constructed within specific power relations.” Combining Wallestein’s core-periphery and Freire’s critical literacy, we can see why a lingua franca as alternative to Spanish has not developed in this case, but instead an indigenous written system as a method of a syncretic religion like Mamatada which can give meaning to the existential conundrum of cultures at the periphery. Population in the region has been growing steadily since the 1950s at the same time that indigenous people started to become a more pressing political issue for the national governments. In the 1970s, Omar Torrijos sparked modernization in the region, perhaps strategically coinciding when Mamatada was taking root among the Ngäbe (Guionneau-Sinclair 1987). Omar Torrijos created the first public schools in their territory, which presumably halted Mamatada’s momentum. Torrijos envisioned a homogenizing nationalist narrative, where all “Panamanians” would form a single cohesive political body. In 1962, the Ngäbe revitalization movement, Mamatada, began in the district of Besigó, also another name for Mamachi, the prophet who proclaimed her divine encounter with Ngöbö, God(s). [Some depictions have two androgynous bodies with beards (Other accounts talk of Jesus and the Virgin Mary)] Her house (ju) is located about a 15-minute (radius) hike from Boca Balsa, a town, about a week by foot to the west of Kiad. Besigó experienced a divine encounter from which she acquired knowledge on how to build a future for her people. From this messianic event, three sets of runic inscriptions appeared on the ground for the Ngäbe to decipher into a written system for their spoken language. The inscriptions were copied to paper and reproduced for those Ngäbe who wished to study and develop them. A copy of the original is kept under lock at a school in Munä, Kiad; home of Manolo Miranda. Manolo Miranda (Tido Bangama in Ngäbere) became the first indigenous person in Panama to create and disseminate an autochthonous writing system based on an orthography that he also developed. Inspired from the runic symbols of the Mamatada religion and the precolonial petroglyphs of the western highlands of Panama, he devised an alternative script to the Latin counterpart. 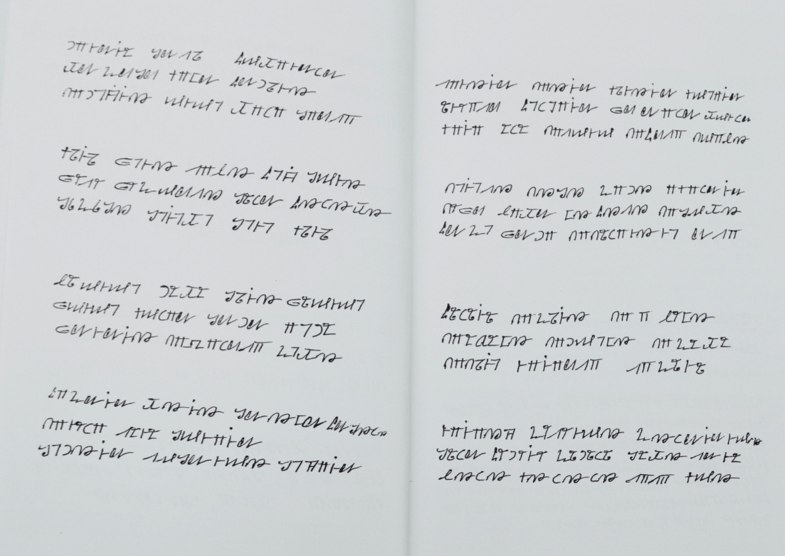 The Ngäbere script is Miranda’s life work. At 74 years of age, he continues to travel the river valleys and the mountain tops of the Ngäbe-Buglé Comarca seeking students to teach. Tido is not literate in Spanish, but speaks it as a second language. The process Tido engaged in for developing and spreading the Ngäbere orthography is unique (Sanchez Arias et al. 2019). Another “revealed” orthography arose among the Western Apache in the very early 1900s, but it was taught only to a few disciples of the prophet, Silas John Edwards (Basso 1990). This process of lexical to symbolic formalization was inspired by Tido’s personal covenant with God. He promised to teach God’s word and the written system for the rest of his days in exchange for having received the knowledge to decipher the inscriptions. In 1967, Tido began practicing Mamatada, and in 1971 he started studying the inscriptions. Tido began a year-long study of the runic symbols. Interpreting them into workable characters, he wrote down 163 words, from which a new orthography was born. These 163 words would come to hold the letters of an alphabet for written Ngäbere. In 1974, Tido consolidated his system, producing 31 graphemes that hold the unique sounds of his languages. Figure 5 shows an example of these words. Without explicitly pointing out which these are, some examples include ñe-uguo (water-eye) meaning where a river is born; Ngäbe (people) meaning indigenous peoples; Jedebe (tomorrow); ñono (sun). The orthography as it can be appreciated in Fig. 5 allows for more precise knowledge of the sounds to correctly pronounce these words, something the Latin script fails to do if one is not familiar with the language already. No outside help was needed to create this Ngäbere orthography. Some guidance was provided by a nephew of Tido, who having completed elementary school education in the nearby town of Tolé was able to organize the letters into alphabet and syllabic form. The epicenter of this movement, the Community of Kiad, is annexed territory to the indigenous Comarca Ngäbe-Buglé in western Panama. In Kiad, Ngäbe identity is tangible in its pedagogy, which also materialized as a de-colonizing effort. The environmental history, linguistic innovation, and political ecology of this community provide means to expand, intellectually, our horizon of justice. In their life-long struggle with state bureaucracy and more recently with a damming project, the people of Kiad teach us about civil responsibilities and nonconformity in the face of corruption and paternalism. Words are, after all, where sounds live. The isolation of sounds from words meant a leap of abstraction that took millennia to occur in the invention of other writing systems. With the help of his bilingual nephew who had studied in the Panamania public schools, together they established combinations of vowels and consonants into syllables, and then into an alphabet. Tido’s sons and daughters are already trying a new approach to expand their pedagogy, whereby they separate the literacy program from Mamatada to help disseminate it as a secular tool before attaching the politics of their religion. This small group of people started a council for its advancement and continuous improvement, eventually it became known as OLEN (Organización de Lecto y Escritura Ngäbe or Ngäbe Organization for Reading and Writing). Its board now includes people from several other hamlets and towns. In yearly gatherings OLEN conducts debates for new vocabulary, holds student contests, and organizes study groups to practice arithmetic exercises. Nevertheless, OLEN’s schools in the Comarca Ngäbe-Buglé are few. In parallel development with the orthography, OLEN provides a schooling program that complements the broader socio-religious revitalization movement of Mamatada. There are very few examples of similar revitalization efforts among indigenous peoples of the Americas. Perhaps Kiad’s orthography and pedagogy together with its North American counterparts show how indigenous people’s landscapes can become spaces for tödiba (schools), garebo (teachers), and jatödigaga (students) to actively seek a praxis of decolonization. To teach to read and write should not ever be reduced to the reductionistic, inexpressive, insipid task that serves to silence the voices of struggle that try to justify our presence in the world…Teaching literacy is, above all, a social and political commitment. However, as has been shown in this case in Chiapas, Mexico, “those in power… both undermine and deny the literacy of the groups they rule or dominate” (Rockwell 2005: 6). This is equally the case for new writers as it is for new writing systems. In the case of Ngäbere, we are witnessing children learning a script that is itself in its infancy. This is a language that is dominated by another (Spanish). The Ngäbe have appropriated literacy and its power to use as a means of revitalization of their indigenous culture and resistance against the colonizers. Appropriation, in this context, is meant as a collective cultural process that occurs under conditions of asymmetrical power relationships, as tools or signs of a dominant group are taken up [or, in the case of the Ngäbe, invented] by subordinate groups and incorporated – often with new meanings and uses – into their own cultural history (Rockwell 2005: 6). The Bilingual System or EIB for writing Ngäbere is promulgated by the Panamanian educational system in the indigenous Comarca, and it is a form of “castellanización.” Castellanización in this case is teaching Ngäbe people to read and write in Spanish and to be Panamanian, by giving the appearance of literacy in Ngäbere. For the indigenous peoples, it is a gamble to maintain their unique ethnicity “in the face of the powerful forces of nationhood carried out overwhelmingly through educational institutions. In other words, language and literacy are not only the means by which the battle is fought, they are the site of the battle itself” (Collins and Blot 2003: 131). The new Ngäbere writing system is quietly entering into this fray. 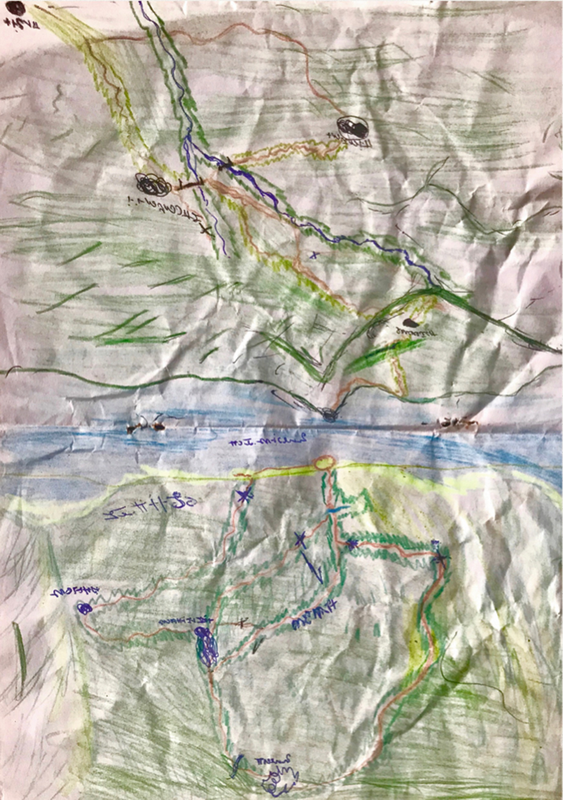 Because of the political components of the situation in the community of Kiad, given incoming extractive projects like dams and mines in the Comarca, their learning also must include a critical literacy approach. Literacy in Ngäbere’s indigenous pedagogy meets a local need. People in Kiad read the newspapers and listen to the radio in Spanish, but transmit the information in the Ngäbere script: taking notes for example, and reading it at gatherings to others. In her book, Language Contact, Thomason (2001) identifies a group of indigenous people in northwest Montana, the Salish speakers of the Flathead reservation, who have a very reduced number of speakers of native language and are heavily affected by English (Thomason 2001). Their youth no longer speak the native tongue, and one can find many loan words throughout. Although Ngäbere is not currently endangered, the question of whether an indigenous language may disappear is always a possibility, especially in the face of colonialism and rapid culture change. Linguistic anthropologists dread the loss of language, which is why we study them. Humanity would lose one of its voices if Ngäbere were to become extinct. As such, a unique syntax that evolved in a particular geography would never be heard again or teach us any longer. As homogenization to colonial languages and cultures takes hold, humanity loses knowledge systems represented by indigenous languages that contain countless configurations, categories, idioms, comparisons, and art (Davis 2007). Thomason (2001: 2) writes that language “contact without full bilingualism is not confined to religious languages.” Religious languages, or languages that are directly associated with a religion, in turn create with this exclusivity, a violent or hegemonic trend when they are dominant, and a isolationist when they are oppressed. Mamatada can be and has been isolationist in this regard. They look down on bilingualism for the fear of losing their language, in parallel with the state education system which created “bilingual” education to explicitly ease the transition of indigenous languages into Spanish (and its workforce). The success of the religious diffusion of Mamatada may depend on the new orthography, however, because Mamatada may help or hinder the diffusion of the new Ngäbere writing system. The success of a new orthography may lie in its relative power to convince its users of its own efficacy. If Ngäbe people continue to promote and develop their culture in the twenty-first century, this new orthography can form a foundation for legitimacy as an innovation. In the words of Collins and Blot (2003: 144), it could help “create a new cultural identity which reflects not only a distant historical or even mythic pre-colonial past, but also incorporates the lessons learned as colonized people.” The separation between language and religion could bring about new users of the orthography who would otherwise resist Mamatada and its isolationist stance. OLEN members, who are largely Mamatada followers, are aware of this and seek to open to the world little by little. Mamatada teaches its followers to critique the Latin encroachment who has come and continues to colonize (Fig. 6). It emphasizes the history of loss and trauma and humiliation. Mamatada practitioners seek to repudiate the widespread stereotype of indigenous peoples as “stupid, or lazy drunkards”. They renounce both the use of alcohol and participation in traditional Ngäbe games like balsería, where villages compete in a stick-throwing game, and in which drinking is involved. They also take the Bible as truth, but like the Rastafarians discussed by John Pulis (Collins and Blot 2003: 145–149), they believe that the next chapter ought to be theirs and that it is now their turn to have God’s favor. But there are already different subsects in Mamatada. Which is presenting problems in Kiad with its pedagogy being accepted by Christians. The exercise of becoming literate in the comarca is similar to that engaged by Sequoyah (George Guess) for Cherokee in the early 1800s. Although illiterate, Sequoyah recognized the power of literacy and wanted that power for his own people. He first tried a logographic system before eventually arriving at the syllabary, which is very congenial to Cherokee syllable structure (Bender 2002). This syllabary is still in use today among Cherokee people. Both Sequoyah and Tido Bangama realized that writing is not a neutral technology, but rather one that is associated with power. For Tido Bangama, his writing system is infused with spirituality. To invent a system from the inside rather than have one imposed in a colonial setting represents a source of indigenous soft power. Within even a twenty-first-century literacy ideology, having their own writing system moves a community from being a nonliterate Other to participation in the so-called civilized world. The overall picture of the linguistic landscape of Panama is clear in its structure: a core colonial legacy and peripheries seeking to establish cores of their own. One exemplary case is the unique orthography of the Ngäbe, which presents itself as an alternative to Spanish. In conclusion this chapter answers the question: What linguistic and psychological processes are at work in the adaptation of one writing system to another? In short, what are the implications and effects of a fundamentally defective script, in this case Latin graphemes performing orthographically for unwritten or spoken languages of tropical Abya Yala. Moreover, how are these unwritten languages affected by the cultural and social context of their adaptation? That is, how semitic religions like Christianity and their coloniality as muscle are unintentionally rendering new syncretic religions like Mamatada that react with a decolonizing ethos. However, serendipitous the Ngäbere reaction may be, the prospects of the Ngäbere script are hard to measure. Apart from the clear link to the revitalization of Ngäbe identity and culture, there could be a potential to inspire other indigenous communities to join in or do something similar. It is safe to say though, that language communities enter the political arena as much as they expand and contract in relation to one another, but linguistic tools can help these flows in favor of gaining outsider recognition. The linguistic landscape that in turn can inform the ongoing political process were people clash to compete or cooperate for natural resources or, hopefully instead, sharing power. In this chapter, we saw how a subset of the Ngäbe has seen the effects of written language in Western societies, the power it has over them, and thus the power they can now redress with their new script. There are many more immigrant languages taking hold of the Isthmus of Panama and yet the native folk have found ways to use the assets locked in their languages to create new spaces of knowledge and to increment their linguistic community’s sphere of influence. Some like the Guna and the Emberá use tourism to some extent, while others look to expand their cultural autonomy without much help of outsider cash influx. In all, the more well-established multigenerational speaker communities like Ngäbere, Guna, Teribe, and Wounaan have an immense opportunity to flourish and enrich the country’s repertoire of linguistic knowledge. A cornerstone work in linguistic anthropology was Joel Scherzer’s (1983) ethnography, Kuna ways of Speaking, which documents the dual nature of Guna language – Medical chants having a distinct grammar and semiotic universe than vernacular Guna. In a similar way this chapter sought to chronicle the work of the Ngäbe in developing a new dimension of their language, that opens up the possibility of literature as a means to coalesce a culture’s identity in a rapidly globalizing world. Apart from the four textbooks produced by OLEN, there is a dictionary being produced in Krwado and music lyrics in all the communities where the Ngäbere script has taken root. The digital development of the orthography is currently in its beta version with a desire to integrate into UNICODE to use in social media and smartphones. The author gets involved with OLEN by helping with his knowledge of modernity and by bridging OLEN’s access to legal advice, technology, and publications.